Two pieces of news relating to buses in and out of Georgetown to report. First, a few more details on the Circulator takeover of the Blue Bus. Second, a report by WMATA on just how slow our buses are. As reported yesterday, the last remaining Blue Bus route will be replaced with a Circulator route starting September 1st. All monthly Blue Bus passes will no longer be valid. Normal Circulator fares will be in place (i.e. $1 for adults/50 cents for senior or disabled riders). Free transfers from other Circulators will be allowed for three hours. Free transfers from normal Metrobuses will be allowed for 2 hours. Transfers from Metrorail will by 50 cents. No word yet on the exact route of the new Circulator. Like the Blue Bus, it will go from Rosslyn through Georgetown to Dupont Circle. But GM doesn’t know whether the Circulator will follow the Blue Bus’s route exactly. GM thinks that the old Dupont terminus is not optimally located (it’s at N and 19th, several blocks from the Metro). But it’s not clear whether another option is available. Next, how slow is your bus? Don’t know? WMATA does. 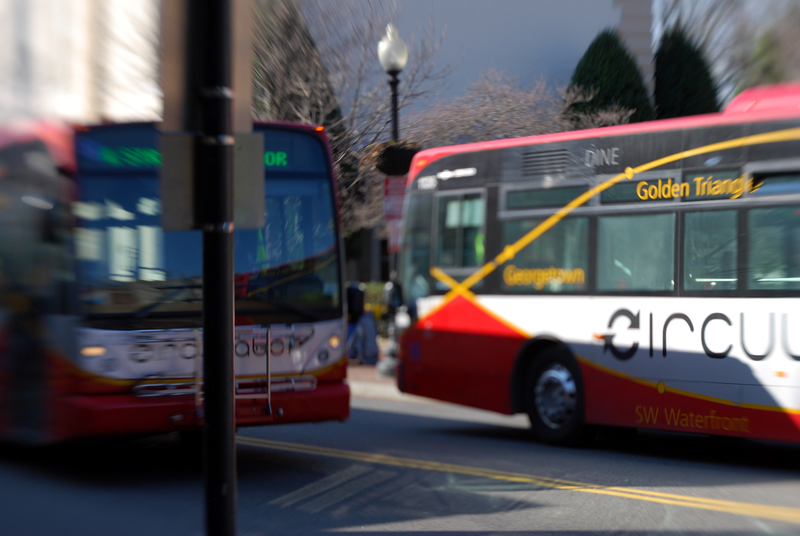 According to an in-house study, buses through Georgetown are not exactly swift. After reviewing GPS data, WMATA determined that the average speed of buses along Wisconsin, M St. and Q St. was only 5-10 mph. The G2 averaged less than 5 mph. That doesn’t sound good at first, but GM wonders, is it really that bad? He takes the Q St. buses every day (i.e. the D1, D2, or D6) and there is never any traffic slowing the bus down. Maybe 10 mph is just to be expected when you have a stop sign every 100 feet or so. Through in a bunch of turns like the G2 has, and maybe that explains that route’s even slower rate. There doesn’t appear to be much we could do to speed up the Q St. or G2 buses, but there is a lot we could do to speed up the Wisconsin Ave and M St. buses. The Georgetown Transportation Study called for dedicated bus lanes on M and Wisconsin. Hopefully this study will strengthen the argument to finally bring those lanes here. I have to disagree with the statement that the Blue Bus terminus is several blocks from the Metro and not optimally located. The Dupont South entrance is, depending on how you look at it, either a block and a half away (assuming Sunderland Place creates a new block) or in the same block. It’s also the easier of the two Dupont Metro entrances to use, as it is not nearly as deep as the North entrance. Fair enough. I must admit I’m more of a Dupont North guy, so I’m a little fuzzy on the layout of Dupont South. I still think it would be better to have the bus pick up right outside the station (like the D2), but perhaps that’s impossible. I occasionally take the D2, D6 or the G2 to come back to the village – though not to depart from it – and the Blue Bus stop is much closer to the Metro entrance than either of the bus shelters for these lines. You can actually SEE the Blue Bus a couple of hundred feet away when you emerge from the Dupont South entrance, if it’s sitting at its stop, and 19th Street is one way and has very little traffic at that end. Try taking it home tonight and see what you think. Well the D2 picks up right next to Dupont North, but I see your point. I just think that given the fact that the Circulator tries in particular to reach out to non-daily bus riders, grabbing their attention right outside the station would be smart. Either way, it’ll be great to have the new Circulator.